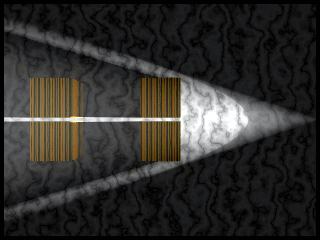 In the picture to the left, a light source beams down upon a surface. Narrowly separated blocks are placed on the surface. The next picture on this page shows the scene from directly above. There are several ways to think about light in physics. One very useful way is to think of it in terms of rays. That is, to imagine light to be traveling in very narrow pencils, or beams. When you do that, we say that you are modeling light as rays. This method allows one to develop an understanding of several light phenomena including common reflections and refractions. It is called the study of ray optics. 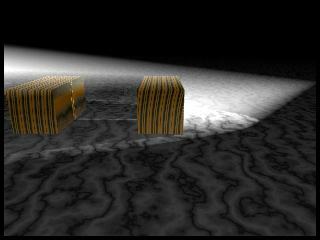 Again, a source of light shines down on a surface upon which some blocks have been placed. In the following picture we are looking at this scene from above. Here we can see how each set of blocks has a narrow separation between them. A small narrow beam of light passes through this opening and finally emerges at the left. This emergent beam approximates what we mean by a ray of light. Actually, the emergent beam above needs to be thought of as being very, very narrow. A ray of light is imagined much like a line is imagined in mathematics. Imagine a ray to be infinitely thin. We use ray optics to trace the path of light. It is not really an explanation for what light is, though.